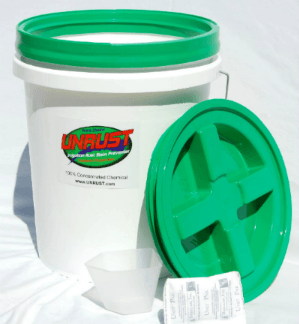 How is UNRUST Stain Preventer different than the other liquid products on the market? A: UNRUST Stain Preventer is 100% chemical concentrate in the dry crystal form. You mix it with water to activate it. This gives you fresh chemical and saves you money by not having to pay for a watered down product. Q: How much iron will UNRUST Stain Preventer work on? A: We have one well where the iron content is 30 ppm. It does take a lot of UNRUST Stain Preventer, but no iron stains. Q: How do I know, how much of UNRUST Stain Preventer to use? A: Add 8 oz. 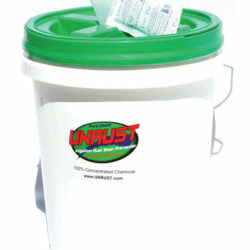 of UNRUST Stain Preventer for every 1 gallon of the “Other Brands” liquid chemical. I.E. : If you use 4 gallons of liquid chemical in chemical tank use 4 cups of UNRUST Stain Preventer. 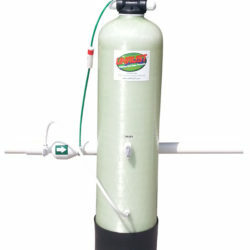 Tip; Just add dry UNRUST Stain Preventer to your chemical tank and add the water, to the tank, to mix. Q: Does the hardness of the water have anything to do with the removal of the iron? A: No, hardness is not a problem for UNRUST Stain Preventer, however when there is a lot of hardness and iron, it may be necessary to up the chemical dosage to get to the iron. 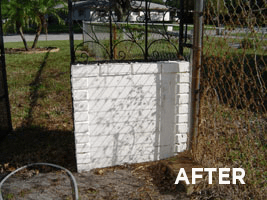 The reason for this is the hardness competes for the UNRUST Stain Preventer chemical and you need to add more to treat all of the hardness and then the iron. Q: How is a good way to get the correct amount of UNRUST Stain Preventer in my water to prevent staining? A: Here is how to get the proper dosage of UNRUST Irrigation Rust Stain Prevention in your chemical tank. Tip: Place a white piece of PVC pipe with one part of it masked off with tape, Tape a section pipe to check for rust staining.in the irrigation zone, after the PVC pipe drys, pull back the tape, if you see the starting of a stain. 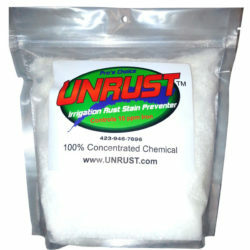 Add 8 more ounces of UNRUST Irrigation Rust Stain Prevention to your chemical tank. Do this until you get the proper mixture. Fill a glass, bottle, or jar with water coming from the sprinklers, set it aside overnight. Then see if there has been a color develop. If it has turned yellow or red, add more UNRUST Stain Preventer. Q: Does UNRUST Stain Preventer go bad, if it is stored over the winter? I had some get hard because I did not seal the lid properly. A: UNRUST Stain Preventer will not lose any strength or go bad. If moisture gets to it, it may set up as a hard lump. If this happens break it up and dissolve it in warm water. It will work fine. 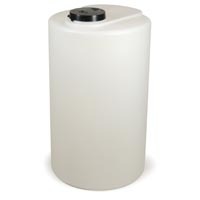 Q: Can I add UNRUST Stain Preventer to my chemical tank, if it has some remaining liquid chemical in it? A: Yes, it will work just fine. Q: I would like to fertilize my lawn, can I add it to my chemical tank with the UNRUST Stain Preventer already in it? A: Yes, you can add fertilizer to UNRUST Stain Preventer without any problem. 8 oz. 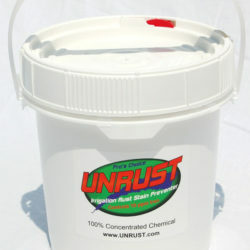 of UNRUST Stain Preventer is the same as 1 gallon of the “Other Brands” liquid chemical. I.E. if you normally use 4 gallons of liquid chemical in chemical tank use 4 cups of UNRUST Stain Preventer. Add it to your chemical injection tank, and fill with water to mix. If you are starting up a new system and you have no idea where to start. Start with 4 cups, of UNRUST Stain Preventer to 30 gallons of water.You can just add the dry crystal UNRUST Stain Preventer directly to your chemical tank and add water. 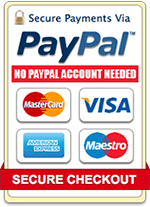 Here is an easy way to get the right amount of chemical needed for your system. 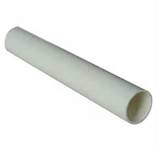 Place a piece of white PVC pipe, masked with tape, in a zone that is the worst for staining. Run that zone with the PVC pipe in a wetting area. Let the PVC pipe dry, pull back the tape and check for any signs of staining. If staining is present, add one more cup of UNRUST Stain Preventer. Repeat steps 1,2,and 3, adding UNRUST Stain Preventer, until no stains are present. If the water has hardness greater than 5 grains per gallon of calcium carbonate, you will need to add 1 cup of UNRUST Stain Preventer, for every 5 grains of hardness. If you do not know what the hardness of your water is, you can get a inexpensive test kit at your local hardware store. On average you will need 1 cup of UNRUST Stain Preventer for every 1 ppm of Iron and 1 more cup for every 5 grains of hardness. The SAVINGS are simple; 8 oz. of UNRUST will equal one gallon of the liquid. 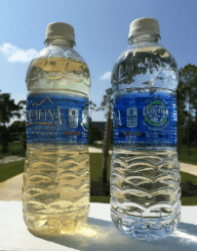 How much are you paying for that gallon of watered down chemical? 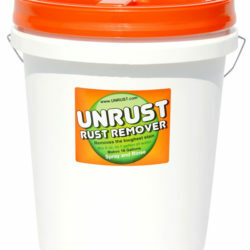 UNRUST Instructions for our Rust Remover. 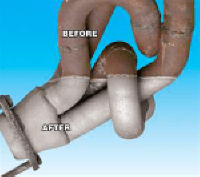 For the removal of iron stains from irrigation of hardscapes. Mix 8 oz. by volume to one gallon of water. Apply to iron stain with a pump sprayer, mop, roller, or brush. Let stand for a few seconds or as long, as needed. After the stain has vanished, rinse the cleaned area with water to deactivate. If the stain is stubborn repeat the process until the stain is completely removed. works on many other things, including copper. metal fencing, or anything else metal. 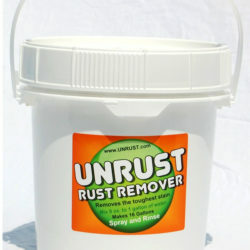 UNRUST Rust Remover – Remove Rust From Anything. Q: Will UNRUST Rust Remover harm my grass? A: No, it is safe to use around grass and plant material. 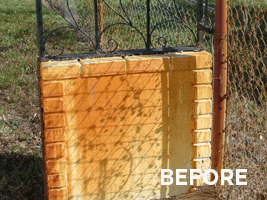 Q: Do I need to rinse UNRUST Rust Remover after I have removed the stains from my concrete driveway? A: We always recommend rinsing to wash away the iron deposits from the cleaned surface. 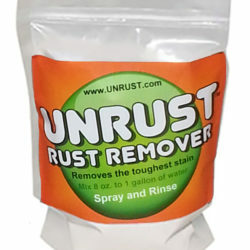 The rinse also works to deactivate UNRUST Rust Remover for a cleaner surface. No, it is safe to use around grass and plant material. We always recommend rinsing to wash away the iron deposits from the cleaned surface. The rinse also works to deactivate for a cleaner surface. Q: We fertilized the lawn and it stained our driveway, will UNRUST Rust Remover remove this? A: Yes, some of the fertilizers use iron as a nutrient and UNRUST Rust Remover will remove it.